Any reader of the magazine Vanity Fair particularly in the 80’s will be familiar with the glittering cast of celebrities, including celebrity villains, parading the pages of The Vanity Fair Diaries which are based on the handwritten journals kept by the magazine’s editor Tina Brown in blue school exercise books. These epistolary details seem designed for loving media exposure. Initially Brown began reviewing her old diaries as background to a book she was planning about “the Crazy Eighties” though she rapidly realized that it was already written in those exercise books. In the first pages Brown quickly sets out her stall making no claims for intellectual profundity: “These were years spent amid the moneyed elite of Manhattan and LA and the Hamptons in the overheated bubble of the world’s glitziest, most glamour focused magazine publishing company, Condé Nast, during the Reagan era.” One of Tina Brown’s many strengths as an editor of such a magazine was that she lived the life she reported upon “day-to-day, night-to -night,” probably assisted as she notes by her allergy to alcohol. 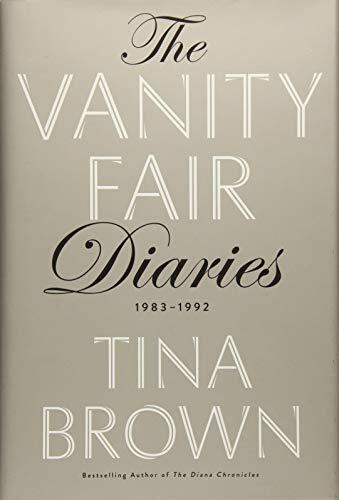 Inevitably a good portion of the diaries is dedicated to in-house political maneuvering, as well as rivalries with Vogue and The New Yorker; Brown edited the latter from 1992 until 2001. There are glimpses of family life (her husband is editor, publisher and historian Sir Harold Evans), and of her gradual transformation from feeling like a Londoner to being a New Yorker. This 448-page volume comes with advance celebrity endorsements from Meryl Streep, Simon Schama, and Anderson Cooper, and offers many enticing vignettes of the Reagans, Princess Diana, Demi Moore, Michael Jackson, Claus von Bulow, and so forth. Although the magazine did not shy away from controversial issues such as “the toll of AIDS on the arts and fashion” in New York, nor from controversial commentary, the overall tone of the diaries is rich and bland, and they are probably best ingested in small amounts like the most expensive chocolates or marrons glacés.